Set on a level plane at the bottom of a sloped garden in Bergen, two key challenges had to be addressed when developing the design of this garden shed: its proximity to a neighbour at the back, as well as respecting existing vegetation. The shed’s distinct curved roof follows the topography of the site, allowing a mature apple tree to branch out above. This soft geometry also minimises its presence when seen from the neighbouring property. Clad in heat-treated spruce, originally light red and warm in colour, a silver grey patina develops with time. When exposed to rain, the material becomes dark grey, adding daily and seasonal variations to the appearance of the shed. 2nd prize of 52 submitted entries to the European architecture competition Europan 13. 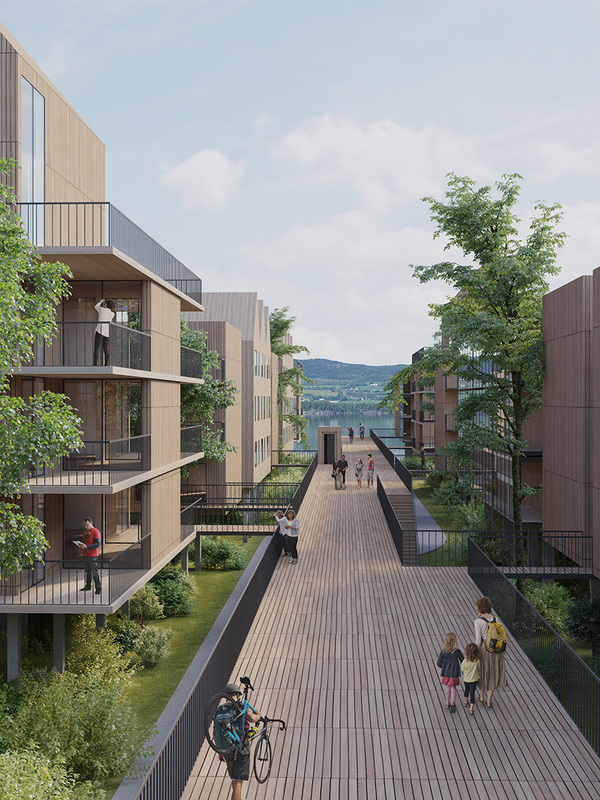 The project Møllendal West gains distinction with its proposal on developing a non-profit housing strategy in Bergen that challenges the traditional property development in Norway. The premise of the proposal is the conviction that the current housing shortage and rise in prices is partly due to lack of innovation. The project studies the desire of the population as well as existing economic, financial and political models of development and counteracts the current situation by suggesting implementation of a cooperative housing model. The urban scheme suggests a density somewhere between the city and suburbia by mixing two typologies. The project is seen as a strong comment on how to build a neighbourhood in a fast growing city. In this sense, the proposal is complimentary to the winning proposal that pinpoints important aspects to consider for the municipality when developing Grønneviksøren as a pilot project. The aspects of landownership and the possibility of public leasing of the land to private housing co-operatives to achieve more affordable housing near the city centre has not been discussed in the municipal plan. In this sense, the project raises a relevant political discussion that could inform the process of developing the Europan site or other municipally owned sites in the city. Anticipating Urbanism received an honourable mention in Princeton Architectural Press’ call for entries to the 36th edition of Pamphlet Architecture, judged by a jury including Steven Holl and Thom Mayne among others. Developed around the theme of buoyancy and lift, it addresses the issue of rising sea levels with an interrogation of the concept of floating cities, a field of inquiry gaining increasing relevance and urgency with the impending reality of climate change. Puerto Rico is in a political and economic state of limbo. Reliant upon the mainland USA for federal aid, and yet crippled by the financial and trade regulations they share, the issue of independence has been a point of contention in the country for centuries. Can we speculate upon an alternative future for Puerto Rico in which an ‘Anticipating Urbanism’ can capitalise on a new independent status? In consequence our project re-imagines San Juan during a transition phase towards independence, proposing this alternative future. The newly inaugurated capital of San Juan looks to its old port as an area prime for innovation and prototypical development. The release of trade regulations could result in a new influx of expertise and materials to the shore of San Juan. Yet as a young country, in which monetary and material resources are low, a new urban environment floating upon the sea is posited as a method to establish and expand the countries self-reliance with minimal investment, exploiting the new incidental physical and intellectual resource to incubate innovative programmes. As a result, this project rejects the proposed vast investment in cruise tourism, as an ecologically unsustainable and low-yielding industry. As the Swedish folk song Uti Vår Hage goes, “Vill du mig något, så träffas vi där”. This inspired us to expand on the notion of a “garden”, to encourage communal use and interaction between neighbours. The garden as a shared resource has been carried through to all external green spaces in the project, most significantly in the central Trädgård, but also in courtyard spaces and landscape edges, providing an integrated network of routes and spaces for play and recreation. Uti Vår Hage presents a vision for a compact and sustainable new development of a significant location between Bjärred and Borgeby. The concept is driven by an interest in car-free mobility, social recreation, local participation and organic growth, with the ambition to establish this new area of Bjärred as a vibrant destination for living and recreation: a good place to live. Well contoured development volumes and phases. By implementing site specific strategies addressing the key constraints associated with Huntonstranda as a site for future development, we hope that the proposal encourages further debate on the direction and nature of Gjøvik’s urban expansion. ned til bakkeplan. Her er det tenkt boliger på nivået med gangbroene, med næring el. på bakkeplan i bygg på 3-5 etg. originaliteten i å sette en hel bydel på påler. Karlskrona, historically a naval city established in 1680 to demonstrate Sweden’s naval powers toward Denmark, has had a key role in national and European realpolitik. Today, Karlskrona is the home port of the Swedish navy and as such maintains its strong connection with maritime endeavours. However, infrastructures of mobility, represented by the arrival oft he railway, and later the highway, have blurred the boundaries between the city and the sea. Trossö, part of the Blekinge archipelago, tells a story about an island that is in danger of becoming a peninsula, undermining in many ways Karlskrona as a city looking outwards to the sea by strengthening its apparent dependence on the mainland. What can be done in the short term to connect Hattholmen with its context and encourage citizens to familiarise with the site?• How do we make sure that Karlskrona’s ambitions for the architectural and urban qualities of this new part of Trossö are met in the long term? Set by a small lake named Skomakerdiket at the Fløyen mountain in Bergen, this project is an interpretation of the traditional "gapahuk", an ephemeral timber structure built in the woods to provide shelter overnight. Approximately 70sqm floor area, the programme comprises a heated room with tables seating 30 people; a kitchen with indoor and outdoor serving; a covered outdoor seating area; and toilets.